I have no doubt that this just scratches the surface of a vibrant underworld of Civil War related titles that cater to those who are looking to reaffirm their belief that mainstream and academic historians have sold their souls to political correctness and every -ism in the book. Today I came across this little gem in my daily perusal through some of my favorite websites. The book summary to Slavery and Lincoln’s War and Aftermath (Outskirts Publishing) is one thing, but get a load of the author description at the end. It’s a classic. Most Americans have tunnel vision when it comes to American slavery and the Civil War. There are facts about each that many of us have not read, have not been taught, and have not even imagined. Think about it. How many of us believe, for example, that the South started the war in order to retain slavery? Yet ninety-four percent of the southern population did not own slaves. Nor did they want slaves. 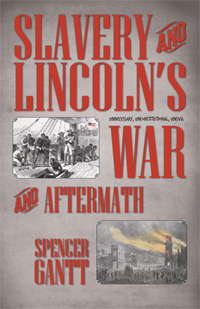 Slavery and Lincoln’s War will take you on the same enlightening journey author Spencer Gantt travelled after reading two seminal works: The Redneck Manifesto and The South Was Right! He presents you here with all of the facts, all equally weighed, so that you can make your own decisions as to what really is the truth about the North, the South, slavery and Abraham Lincoln. Find out who trafficked slaves to the North American shores. Learn how the Union Army conducted a war against civilians. This book will shed new light on the complicity of many who have claimed to be “pure and without sin” when it comes to these two American evils, slavery and Lincoln’s war. Gordon Spencer Gantt has no accolades, holds no super diplomas, has no pedigree of published writings to impress you with. He’s an average guy, a Joe Sixpak type of guy, and he has written this book from the viewpoint of the common man. He is a native of South Carolina, born in Pickens County, and he graduated from the University of South Carolina. He is a retired chemist and is married with three grown children and four grandsons. He’s also happy to be alive and to be a Southerner. What is this “pure and without sin” nonsense that Confederate apologists always throw at those who point out that slavery was the fundamental cause of the Civil War? The Confederate apologists always frame themselves as fighting back against what they portray as a grade-school-level understanding of history presented by politically-correct, liberal, Lincoln-worshiping academics blahblahblah — you know the script. They rarely credit professional historians (or serious hobbyists) as having a more complex or nuanced understanding of history than found in a 3rd grade President’s Day pageant script. And I suspect they get away with it largely because their audience avoids authors like Blight or McCurry or Faust or Foner. What I find amusing is that their own “truth” about the war is every bit as simplistic and uncritical as they accuse others of being. Kevin forgot to mention that Mr. Gantt is also the author of that landmark work of complex political thought, Vote the Bastards Out! Democrats, Republicans, Incumbents. I spent the better half of my son’s 8th grade term arguing with his history teacher and principal. Here in Georgia our students only get 2 shots of civil war (sic) teaching, in 5th and 8th grade. His 8th grade shot last 1 week. Out of 1 week, he was taught lies like (until I intervened) Nathan Bedford Forrest was the founder of the KKK. Perhaps you will share the references used by Mr. Allen in his editorial. I’m certainly not going to defend craptastic K-12 textbooks, of which there are many. But I also suspect that your defense of Forrest was more intent on disassociating himself from the Klan at all, rather than correctly defining his (rather substantive) involvement in it. Even his admiring Pelican Press biographer, Shane Kastler, acknowledges he was a “grand wizard” in the organization. Pleading the 5th on your assumptions 🙂 but rest assured I didn’t limit myself to that issue alone. Among other things wrong with the class teachings was a ‘fact’ that the NAACP was created by 7 blacks. This was included in my letters to the school leaders as part of thier errors, as if I needed to provide any balance to you.
. . . as if I needed to provide any balance to you. I didn’t ask you to provide balance, to me or anyone else. You’re entitled to voice your concerns about whatever you want. Another history book written and I assume reviewed by non-historians. While I’d characterize many of the letter writer’s statements as debatable, there certainly are factual errors as well. I never knew that these little, author-owned cottage textbook publishing industries existed until this year, and I find it rather disturbing. That’s right. So on one level I agree with Mr. Bearden, but not for the reasons he assumes. I’m a big fan of Southern Civil War-era newspapers. I’ve read through many of the ones that survived to the microfilm age, and I’ve transcribed many articles to my webpage. One thing that has struck me over the years is how often during the war, right through to the end, the federal Army was referred to either as “the abolitionist army” or “the abolitionist forces” or just “the abolitionists.” Never once have I seen it referred to as “the high tariff army” or anything like that. Given that the Southern newspapers in Confederate-held areas would naturally be more pro-status quo, pro-middle to upper class, to me it does say something about what the editors and those writing in to the newspapers thought about the perceived motive of the Northern army (abolitionism) and the motive of the South (defense of slavery). There are, of course, many references to “invaders,” “vandal horde,” etc., that would also indicate another major motive, once the war had started, of defending homeland. It’s just interesting to me to look at the descriptive words that people of the period used. One does not come across complaints about the tariff as a major theme in the letters of Confederate soldiers, either. Of the 320 in my “Reluctant Rebels” sample, none ever mentioned taxation of any kind. Heck, tariffs were the best part of Ken Burn’s “Civil War.” Don’t you remember the section where Willie Nelson read a letter from a Texas infantrymen about to go into battle at Shiloh? While “Ashokan Farewell,” played softly in the background he read the part where the man told his wife how he hated to leave her and their baby but the damn Yankees had raised the rates on Schedule C, Part 2b, Subsection 5.4, “Gears, iron, small” by 10% and he couldn’t sit by and do nothing! Brought a tear to my eye. I didn’t mean to steal your thunder. It’s just that their definitions worked well in my response to Brooks’s post. Sorry about that. No problem…I don’t think we are in competition…I see us as more on the same page and thought it interesting that you were thinking the same thing that I was when Iread those definitions. Last night I went to a talk by Harvard professor Jill Lepore in which she spoke about this disturbing anti-expert trend in our culture. Lots of Americans revere history, but they reflexively distrust anyone who’s spent years training for and working in the field, as well as the actual results of most ongoing work. They pay fealty to the Constitution, but disdain the lawyers who’ve spent the most time studying it. Of course, many of those same people distrust the “media” (making exceptions for their favorites, usually provided by vast multinational multimedia corporations). That means they distrust standard book publishers. If it’s any comfort, Outskirts Publishing is a vanity press. After a book like her last one–deeply flawed by presentism and PC–is it any wonder that the public is “anti-expert” when it comes to academic history? Are you referring to Lepore’s The Whites of Their Eyes? Because the problems of presentism and bending historical facts to what one finds politically acceptable are big themes in that book, as some reviewers noted. Those themes also came up in Gordon Wood’s critical review, which said Lepore was too critical about contemporary, politically-driven reinterpretations of history. I read GW’s review of her book. I find much of her work, esp in the New Yorker, to be politically-driven reinterpretations of history. Her writing in the New Yorker is more overtly political, but why would that surprise you? On the other hand, I think you will be hard pressed to take such a narrow view of her scholarly work. Her study of King Philip’s War is one of the best scholarly treatments of this event. I’m sorry, but I can’t tell from your comment whether you called The Whites of Their Eyes “deeply flawed by presentism” because of Wood’s criticism or because of your own reading of the book. I’m also not sure how an analysis of a present-day phenomenon could be too “presentist.” Since Wood’s review actually said Lepore should be more deferential to interpretations of history driven by current political or cultural concerns, that suggests that he found the book not “presentist” enough. I think Lepore’s brief from the New Yorker is to comment on present matters with the eye of a historian, so, like Kevin, I’m not surprised to see those articles reflect both present-day concerns and her own politics. The Whites of Their Eyes grew out of that assignment, as opposed to her earlier studies. Hi Kevin. Many thanks for the head’s up about this book. I’m going to buy it and review it on my blog. Hi Kevin. I picked up an e-copy of this “book” on Amazon. Perfect, I only expended $4.95 for it and got it instaneously. My initial impression is that this is an amateurish bit of self-publishing put out by a high-tech vanity press. I was initially impressed that Gantt had seven reader reviews already on Amazon (I’ve gotten 3 in 7 years for 2 books) until I noticed that Gantt’s book is either the only one they ever reviewed or the only books they’ve reviewed are written are by Gantt. Plants obviously. This guy is trying to get attention and we’ve given it to him. I’m afraid we got sucked in by the cover of this book. It’s about the only thing with a hint of professionalism tied to Gantt’s work. I think I’m going to give this book a short wrap up post and then forget about it. The Gantt’s of the world collectively are worthy of attention as a social phenomenon, but about the best you can be said of Gantt’s book is that its representative of the genre from which it emerged. Make no mistake about it, Gantt’s book will sell more copies than anything we publish. I wouldn’t worry about the attention that we have given this book. An entire book based on exactly fourteen published works, and only one of them even partially a primary source. Forget about interpretation, we wouldn’t approve that level of research for an undergraduate senior thesis. It wouldn’t even work for a high school research essay. How could The Redneck Manifesto ever be classified as a seminal work? The title alone disqualifies it! The last paragraph is just another attempt to show that those who do have credentials in this area are just highbrow elitists who want to rewrite history. What a crock! I don’t think he knows what seminal means. Its quite fascinating how some people become immediate Marxists when they assert how Confederate soldiers couldn’t have, wouldn’t have fought for something that supposedly wasn’t in their immediate economic interest. It’s good to know he’s happy to be alive. I always wonder that about authors whose books I’m thinking about purchasing, but they seldom tell me. I’ve always loved the “Northerners made us do it” excuse. Aside from the fact that there were Southerners involved in the transatlantic slave trade, including one of the Founding Fathers, Henry Laurens of South Carolina, one of the largest slave traders in the country until he gave it up, it was not a matter of New England maritime interests forcing unwilling Southerners to purchase slaves at gunpoint. Those interests were amoral; if there was a demand, they’d supply it. South Carolina, in particular, imported massive numbers of slaves from Africa in the years leading up to the end of the constitutional moritorium on legislation against the transatlantic slave trade. Especially in the 1850s, there was a major movement in the Deep South to have Congress allow the transatlantic slave trade again. Finally, all that the 1808 legislation ended the TRANSATLANTIC slave trade bringing new slaves from Africa, the inter-and intra-state slave trade was massive and I know of no significant northern involvement in that. One of the great fears of the slave states was that, if forces unfriendly to slavery took control of the federal government, that they’d try to use Congress’s constitutional power over interstate commerce against the interstate slave trade. “The poor men of the South are the holders of one to five slaves, and it would be equally consistent with truth and justice to say that they represent, in reality, its slaveholding interests”. Four or five slaves would represent roughly four to five thousand dollars, from what I have read. Were these really the poor men of the south? Or maybe just the up and coming middle class? There were that many in this class? This report sounds a bit like the Steiner report that proponents of the black confederate myth like to quote. I don’t know, though, that is why I am asking. How reliable is DeBow? DeBow would have been more accurate to say something along the lines of your phrase, “up and coming middle class.” I don’t know DeBow in detail, but it’s likely that actual poor whites — known then to whites and blacks alike as “white trash,” an ugly term that survives to this day — didn’t much enter into his calculations. Using the Census Data tool at Univ of Virginia (http://mapserver.lib.virginia.edu/), in the 1860 in Virginia the proportion of slaveholders owning 1-5 slaves to the total number of slaveholders was 28,588 out of 52,128, or 55%. In Mississippi, which was relatively more agrarian and more invested in the large plantation system, the proportion was lower (41%), but still significant. In Texas, which relatively few very large plantations, small slaveholders represented over 58% of the total. Slave prices soared to speculative levels in the 1850s. A health young male field hand could sell for a $1000 or more. According to one web site I checked, this would be $28,300.00 in US dollars today. One reason that some advocated the reinstitution of the African slave trade was to bring slave prices down due to concern that, if prices remained so high, non-slaveholding whites would come to believe that there was no hope of they or their descendents ever becoming slaveowners. Virginia’s opposition to this was critical both in the antebellum period and in the Confederate constitution. In essence, Virginia, a major exporter in the interstate slave trade, did not want the prices that slaveholders could get diluted by cheap foreign imports. In addition to the fact that confining slaveowners to the holder of the title in the slave distorts the true picture of slaveholding families, as you point out, leasing slaves was a MAJOR market in its own right. It allowed individuals and families that could not afford to purchase and/or maintain a slave outright to get their foot in the door of the slave-owning caste. It also was a way for slaveowners to get additional income, especially in seasons when the owner did not need the slave so much. Leasing put the upkeep on another while putting cash in the owner’s pocket. It was not unusual, for that reason, to find slaveowners, in their wills, bequeathing slaves to women and children for the intended purpose of having the slave(s) leased out and providing income for the heirs. It also leaves out people who provided goods and/or services to the Peculiar Institution. Finally, both racism and fear were used by the upper and middle class to bind the poorest whites to them. My mother’s a chemist. Chemists are a lot of things, but “Joe Sixpack” ain’t one of them. He’s got a bachelor’s degree and he’s retired, so he’s most likely solidly middle class or better, putting on working class airs. Bad enough he’s historically ignorant, but he’s got to lie about his social standing to be authentic? Southron gentlemen can’t be properly educated? Oh for crying out loud. Who has the strength to read one more of these things? I’d rather watch Orly Taitz argue another Birther case before the court. At least I could chuckle, and feel that common sense will prevail. Just goes to show you — even chemists can be idiots. Where does one get one of those “super diplomas,” McDonalds? Costs more, but you get extra fries with it. I wait for your next book on the science of chemistry…….. Your first amendment rights are not being violated. My readers are free to disagree with what I write; however, what you are not free to do is engage in personal insults. You are free to start your own blog to highlight such silliness. Is this another case of ignorance about the Constitution? Twenty percent of the American population controls eighty percent of the nation’s money. The other eighty percent of the population – that’s us, the average citizens – only control twenty percent of the money. Gantt’s often humorous, but always earnest book promotes a second American Revolution, held not on the battlefield, but at the ballot box. By continuing to vote for Democrats, Republicans and incumbents, we average citizens guarantee there will be no change to those vested interests and no return to a government of the people, by the people and for the people. His solution is a simple one and one that follows the bidding of our own Declaration of Independence when it calls for us — the average citizens – to alter or abolish our government when it no longer derives its just powers from the consent of the governed. So vote the bastards, the PRC’s out. Vote other average citizens, your sane friends, in. …. Mr. Gantt graduated from USC in 1972 with a BA in chemistry. … as pointed out, it’s a vanity press, with a wide range of topics from all sorts of perspectives. The 94 percent figure is only relevant if 94 percent of the South also supported secession. My impression is that this is not the case. As Americans mark the Civil War Sesquicentennial, historians are fighting a battle over the reputation of the nation’s sixteenth president. Featuring leading historians such as Eric Foner, Jay Sexton, and Lerone Bennett, JR., Abraham Lincoln: Saint or Sinner? unearths another Lincoln: a politician rather than a statesman; a pragmatist as opposed to a visionary; and a war criminal instead of a war leader. The Lincoln presidency was previously considered beyond scholarly debate with misdeeds often brushed under the historical carpet. Abraham Lincoln: Saint or Sinner? follows on from American Idol – Reagan and JFK: The Making of Modern Politics, also shown on the BBC this winter. Previous post: What’s Wrong With the Black Confederate Debate?